When it comes to contenders for the perfect European city, Nice effortlessly earns a place at the top table. Once part of Italy – it became French as recently as 1860 – this sun-drenched destination blends French cool and Italian sophistication in just the right amounts. Nestled on the curve of the Côte d’Azur, Nice enchants with its glittering azure seas, rolling beaches and even more natural beauty inland. 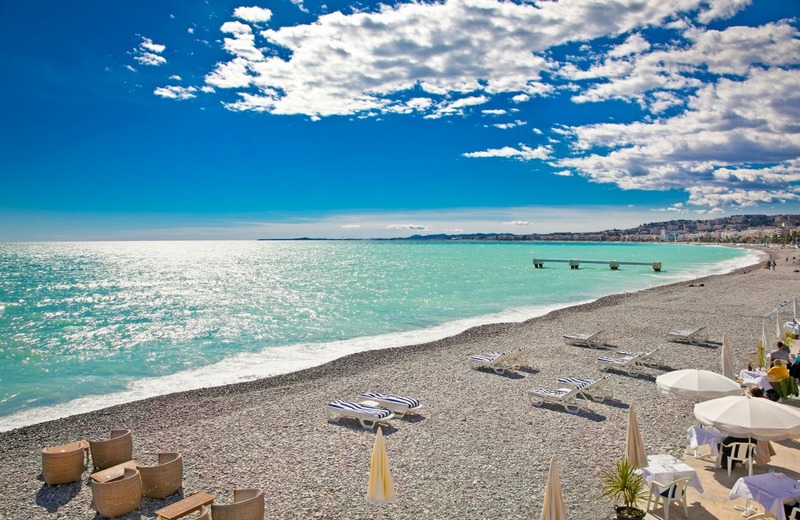 As a highlight of the fabulous French Riviera, Nice has long attracted the great and the good, the rich and the famous. It doesn’t just promise glamour, it delivers it in spades. Whether heading out for a stylish dinner, trying your hand at the roulette wheel or promenading along the beach, Nice is a place to see and be seen. At the same time, it has a friendliness and approachability that makes it a hit with all kinds of travellers from all over the world. The contrast between the sleek Promenade des Anglais and Vieux Nice – the colourful old town – showcases the infinite variety of the city’s treasures. Add in famously great food, grand boulevards and its proximity to other famous resorts, especially when you have a hire car, and Nice’s appeal speaks for itself. There’s nothing to stop you simply heading to Nice for a beach holiday, especially when there’s the prospect of lying next to some of the most impossibly blue water in the world. That said, strolling along the coastal Promenade des Anglais should be right at the top of your to-do list. Built in the 19th century by British emigrants who followed the sun and put their roots down in France, this famous strip traces all five miles of the Bay of Angels. In one direction you’ll discover sea views to soothe the soul, in the other, handsome Art Deco buildings and tempting restaurants. Nice’s historic core is called Vieux Nice, the old town that existed long before the expats and tourists arrived. Immerse yourself in the labyrinth of pretty streets, chancing upon old churches, boutiques, chocolate shops and more. 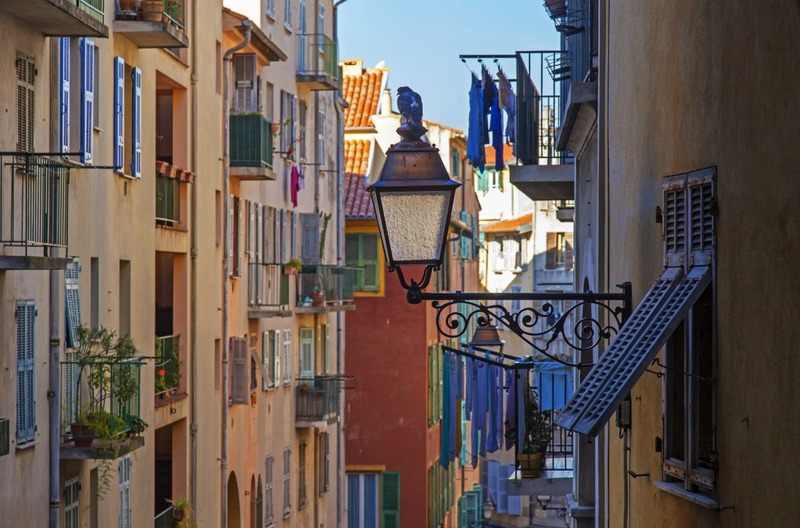 You’ll find plenty of marvellous architecture in Nice, with a diverse range of styles from the baroque to the Gothic. The much-loved Chapelle de la Miséricorde, dating from 1740, is a highlight with its buttercup yellow walls and vivid interior frescos. This is a city steeped in art too, with the world’s largest collection of Marc Chagall pieces on display at the Musée National Marc Chagall and, away from the centre, an ever-changing selection of exhibitions at the fantastic Musee Matisse. Many of the museums in this area are housed in ornate buildings worth the admission price alone. Make time to admire the Cathédrale Sainte Reparate, originally built in 1650 with the later addition of the current facade. Embellished with ornate altarpieces and housing 10 different baroque chapels, this impressive structure is a place of peace. The neoclassical Musée Masséna is in the new town, close to the Promenade des Anglais. Beyond the landscaped gardens and gorgeous belle-époque exterior, you’ll find an interesting museum which chronicles the local history. With the French Riviera’s coastline stretching for more than 70 miles, finding an idyllic beach spot is a breeze. All you have to decide is whether to get away from the crowds or head to the heart of the action. The beaches around Nice are all pebbled, so it’s well worth hiring a sun lounger or investing in some inexpensive mattresses if you’re planning to spend a day on the beach. Suitable footwear is also a must. The pebbles, known as ‘galets’, are a source of pride to the locals and these flat grey stones help give the sea its vivid blue colour. 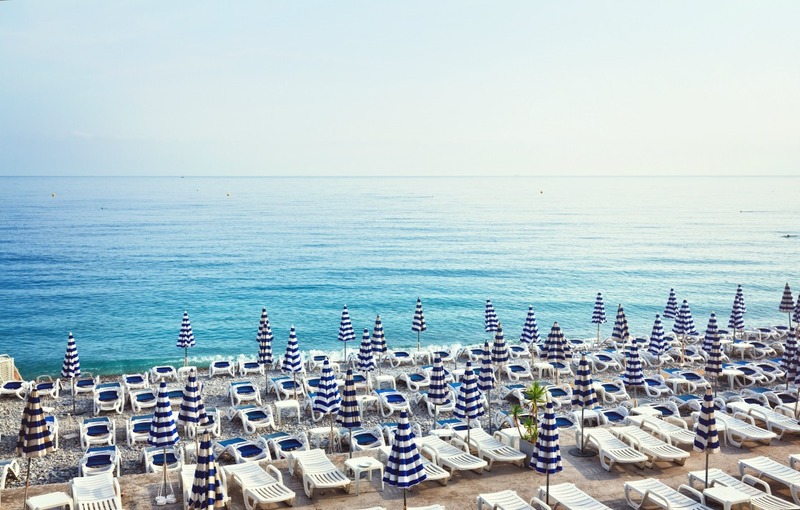 Home to the iconic blue and white parasols of the Nice seafront, Plage Beau Rivage is a chic beach hangout with an area for every mood. Relax on the plush sun loungers, available for full or half-day hire, whiling away the hours from the comfort of a fluffy blue towel. There’s a volleyball court for those feeling sporty, and restaurants serving up moreish Mediterranean snacks and refreshing cocktails. When the sun goes down, the party gets into full swing and holidaymakers dance into the early hours at lavish themed events. Settle into the smooth curve of a coastal rock at Coco Beach, a public beach found alongside Avenue Jean Lorrain, heading eastbound out of town. This popular local haunt effuses natural charm with its craggy cliff seating areas. Cool off in the glinting aqua waters, which are crystal-clear thanks to the smooth grey pebbles on the ocean floor. Immerse yourself in this simple, relaxed experience and pack a picnic of local cheese, meats and fruit tarts to enjoy while soaking up the coastal views. Centrally located on the Promenade des Anglais, Florida Plage is a trendy beach club with a party vibe. Luxuriate on the sun loungers, which are available for hire, or take your spot on a glamorous four-poster sun bed. Enjoy drinks and refreshments delivered at your leisure, or take a seat on the decking for a more formal dining experience, tucking into vibrant salads, fresh fish and succulent meat. Known for its beach parties and resident DJ, the atmosphere at Florida Plage is upbeat and exciting. 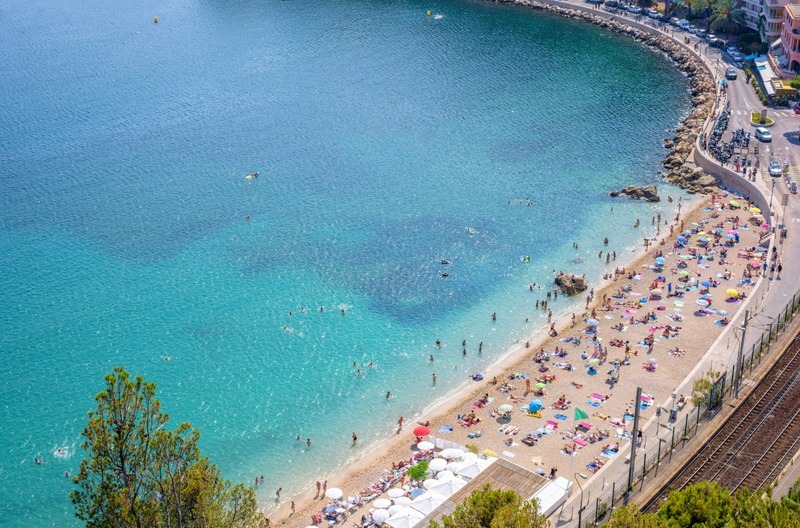 Found in the neighbouring town of Villefranche-sur-la-mer, this public beach is a relaxed sweep of sand and small pebbles. The water is shallow and serene, which is ideal for families, and the beach is popular shell-hunting ground for kids. Pick up an ice cream from one of the nearby kiosks and relax on your towel, watching the bright white sails bob along the waves. Nestled between Nautical Club and the glamorous La Plongeoir restaurant, this intimate suntrap is found in a quiet nook of the shore, just yards from the central promenade. As the soft white foam of the rolling waves laps against the pebbles, sun worshippers soak up the golden rays on the trademark grey pebbles, which were originally reserved for military personnel. Stepladders lead down into the cool blue waters, welcoming swimmers and snorkelers to take a dip and discover the marine world below. If you’d like to get active, the public stretch of Plage Opéra is the perfect spot. So-called because it lies in front of the city’s ornate opera house, this palm-lined stretch of pebbles is a watersport hub. Get a thrill from water skiing, kayaking, stand-up paddle boarding and more. With the nearby Opera Plage restaurant offering a delicious menu of French cuisine, you can easily spend the whole day on this central beach. Befitting a city that’s undeniably French yet still retains a keen sense of its Italian influences, Nice boasts a thriving food and drink scene. For light bites, you’ll easily find a cafe or restaurant serving up deliciously fresh fish and seafood. Popular local dishes include socca, a chickpea flour pancake that can be found on many of the city’s streets, and salade niçoise, born in this city and now served the world over. 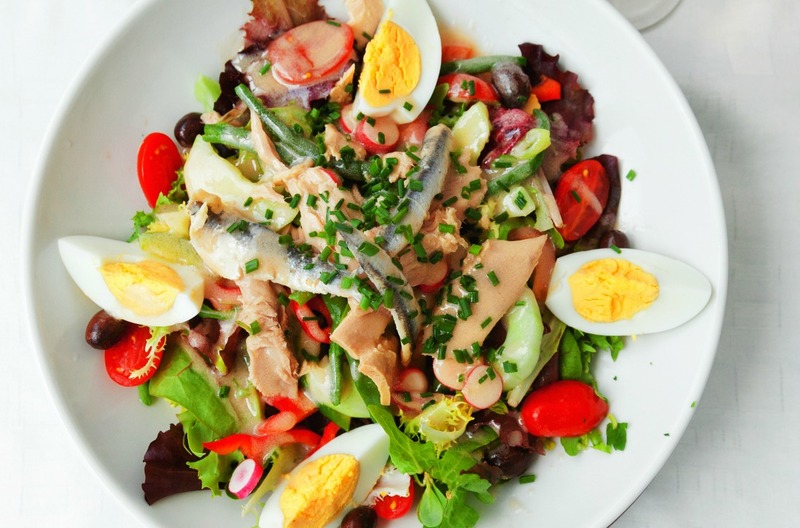 Purists may argue about the make-up, but as the sun beats down and you tuck into juicy tomatoes, creamy eggs, tangy olives and salty anchovies, perhaps with the addition of tuna and green beans, you’ll savour every forkful. As you would expect in such a glamorous destination, Nice is not short of fine dining experiences. At Le Chantecler you’re paying for world-class cooking. Boasting two Michelin stars, it offers a tasting menu that includes roast pigeon with straw sauce and John Dory teamed with flame-grilled celery. Push the boat out even further by staying in the hotel it sits in. The Negresco has played host to royalty and celebrities aplenty, from The Beatles to Princess Grace of Monaco. Opened in the 1900s, this hotel effuses old-school opulence and serves up wondrous views of Nice. For something a little different, look out for La Roustide on Rue Beaumont – a place that specialises in dishes derived from the sought-after tuber truffle. Risotto, Brie and even seabream tartare are accompanied by rich black truffles, although there are some fine alternatives if the truffles don’t tempt you. If you’re in need of some respite from the summer heat, you’ll find it at Hotel Windsor. Much like the Negresco, this hotel has been welcoming guests for over a century, and a recent revamp has only made it more sumptuous. The pool, garden and hammam, complete with spa treatments, offer the perfect place to relax and unwind. Customer satisfaction is the watchword here, with vegan and gluten-free menus alongside the standard a la carte selection to ensure all are catered for. Whether you’re staying in the city or embarking on a French adventure with car hire at Nice Airport, the Riviera is your oyster. Head east or west, passing secluded coves and bustling beaches, classy resorts and cliff-top restaurants perfect for lunch with a view. Make for Cannes and walk in the footsteps of the stars who dazzle at the annual film festival. 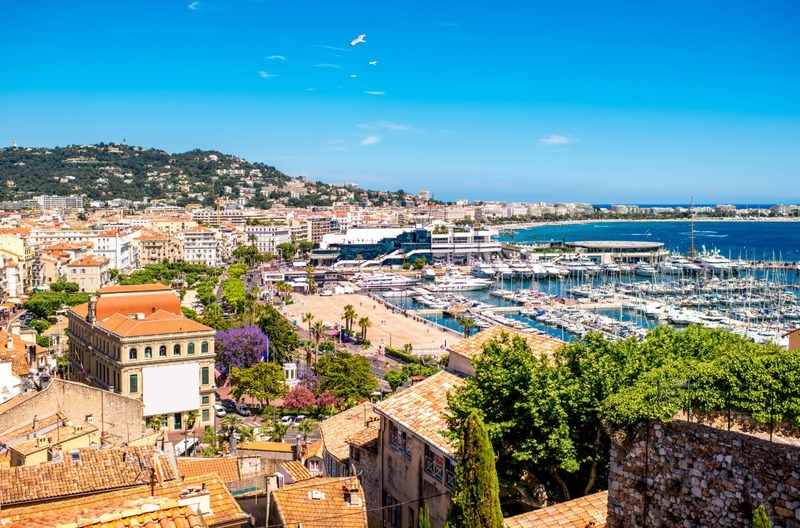 If you plan on coming during the Cannes film festival, you’ll need to book way, way ahead, as rooms fill up quickly and hotels ramp up their rates. For a more peaceful experience, you could explore Cannes’ iconic La Croisette promenade, the old town and harbour. Drive west to visit the resorts of Antibes and Juan-les-Pins. Antibes is home to the Musée Picasso, where the artist Pablo Picasso once lived, as well as a lively port area. Juan-les-Pins is a postcard come to life, winning the heart of author F Scott Fitzgerald, who came to live here, and inspiring works by Picasso and Claude Monet. It’s quiet here out of season, but perfect for a day trip. You could also admire the rural beauty of the Préalpes d’Azur Natural Regional Park. Drive one hour inland, along the D2085 route, and enjoy a full day of open-air adventures against the epic backdrop of hilltop forests, rugged gorges and quiet medieval villages. Hike along the winding trails or take your bike and tour on two wheels. The historic Route Napoléon is one of the highlights, stretching for 180 miles in the footsteps of the famous French leader. From quiet coastal villages to Nice’s iconic promenade, soak up the French Riviera in all its glory with a hire car.